Carmen passed two men in white uniforms urgently pushing an empty gurney along the hall. No smiles, no greetings. Just full speed ahead. She’d never seen them before. Could they be weekend staff brought in to help in Rocco’s absence? The men didn’t look like the normal paramedics she’d seen around town. Then again, she’d only worked over a week here, and there were probably many workers she hadn’t run into yet. When she reached the nurse’s office, she found Detective Ritchie sitting with Mrs. Hood and Nurse Blair. She passed through the room, trying to catch Ritchie’s eye. News? Carmen’s heart skipped a beat. Had they found Rocco? Nobody was smiling with relief. In fact, the mood between the three women was somber. Far too somber. The world spun. Carmen clutched the side of the desk. “Then where is he?” she whispered. Carmen felt the blood drain from her face. Had Rocco harbored a secret depression? Did he have demons he never shared? She wobbled, then blinked hard. “No. He wouldn’t have.” She locked eyes with Ritchie. “It makes no sense. Where’s his car, then? It would be in the lot if he did something that crazy.” She shook her head adamantly. “No. He was taken,” Carmen said. An eruption occurred in the sunroom, visible through the window. Lolly was dancing on the puzzle table, kicking pieces gleefully all over the room. Evie—the mousy little nursing assistant—stood beside the table, wringing her hands and begging Lolly to get down. She didn’t seem to have much effect on the crowd, which now erupted into chaos. Magazines flew through the air, a table was overturned, and almost every one of the residents were either sobbing or shrieking with laughter, standing on chairs and clapping for Lolly. Rosita set the aromatic basket behind the television set and waved her daughter off. “I had to do something, Carmencita. I can’t just sit around all day and worry.” Before they could say more, Rosita walked steadily toward Lolly, who still danced like a Woodstock hippie on top of the table, head down with her long hair swirling about her, arms outstretched, and her feet propelling her in small circles. The residents stopped in their tracks, watching and shuffling back to their seats. Several eyed the basket of cookies. Evie helped a few residents back to their seats in front of the television. Carmen reached up to help Lolly down from the table. “Do you mean Mrs. Hood?” Carmen glanced sideways at the woman who still sat with the detective with a haughty expression on her face. Could she have hurt Rocco? And why in God’s name would she? “Yes, Miss Lolly. Snickerdoodles today.” Rosita exchanged a puzzled glance with her daughter, mouthing the words someone took him? Mr. Harvey sat on the ground, a dazed look on his face. A small scratch bled over one eye. With hand gestures and a wave at Detective Ritchie that implied she’d return after tending to her patient, she slowly walked the shaking man down the hall. 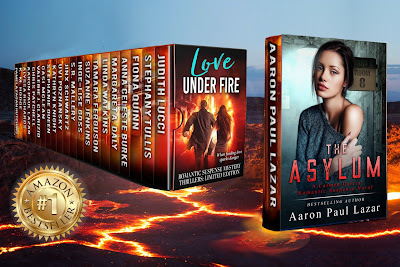 Get these 21 brand new novels, never before published, in one boxed set! Thanks for posting this! Loved it. I can't wait to read the book! Thank you so much for sharing, Uvi. ;o) This is one awesome bookset.